Olympus has announced a new DSLR camera that is the little brother of the E-620. 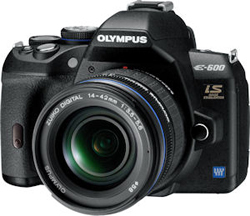 The new camera is called Olympus E-600 and has a few less features than the E-620. Olympus has removed the backlit button feature, a few art filters on the E-600, two-shot multi exposure mode, and the aspect mask control. Other than that the E-600 is very similar to the E-620 except for the price. The Olympus E-600 DSLR camera will be available in November 2009 and cost about $600 for a camera kit with the Olympus Zuiko ED 14-42mm f3.5/5.6 lens. CENTER VALLEY, Pa., August 31, 2009 – The new Olympus E-600 is a digital single lens reflex (DSLR) camera with everything you need to start enjoying the benefits of DSLR-quality photography today. It’s simple to use, so moving up from a basic point-and-shoot is an enjoyable and affordable experience, and packed with features to meet all of your still photography needs. The E-600’s high-performance swivel 2.7-inch HyperCrystal™ LCD screen helps you compose from virtually any angle; in-camera Art Filters add more pizzazz to your pictures; its four-frames-per-second burst speed won’t miss a moment of the action, and In-body Image Stabilization removes blur caused by camera shake when you’re on the go. The 12.3-megapixel image sensor and TruePic III+ captures detailed, crisp images and accurate color. Whether you’re shooting a high school basketball game or capturing a city streetscape, the E-600’s high-performance 12.3-megapixel Live MOS image sensor delivers excellent dynamic range, accurate color fidelity, and a state-of-the-art amplifier circuit to reduce noise and capture fine image details in both highlight and shadow areas. Its Live MOS image sensor is complemented by Olympus’ TruePic III+ Image Processor, which produces clear and colorful photos using all the pixel information for each image to provide the best digital images possible. The new image processor is noted for accurate natural color, true-to-life flesh tones, brilliant blue skies, and precise tonal expression; it also lowers image noise in photos shot at higher ISO settings, enabling great results in low-light situations. The E-600’s 100 percent accurate 270 degree swivel 2.7-inch Live View HyperCrystal III LCD can be rotated freely so photographers can compose at any angle, including overhead and down low, without getting bent out of shape. This makes it easier to photograph young children on their own level or shoot high above a crowd. E-600 photographers can compose a subject right on the Live View LCD and see the results of the various creative features – live as they’re happening, before the shot is taken. With Live View, settings like white balance and image brightness can be selected, and the result can be seen instantly on the LCD display. Real-time Live View offers amazing versatility and creative control. The LCD displays 230,000 pixels in vivid color and includes HyperCrystal technology, which offers many times the contrast of conventional LCD monitors for easier viewing in both preview and playback. It also provides a wide viewing angle of 176 degrees, which ensures images can be composed from even the most obscure angles. The 2.7-inch LCD makes icons and text on the camera’s menu easy to view. Life moves fast, so it’s important to have a camera that locks focus accurately and quickly. Whether you choose to use the super fast autofocus technology or focus the lens manually, the E-600 offers the same sophisticated focusing options as higher-end DSLRs. Use the optical viewfinder to track movement like birds or wildlife or your favorite team on the field, or use the large Live View LCD to frame up a flower or a group of friends at the family gathering. Consumers accustomed to composing and focusing using a point-and-shoot camera’s LCD will appreciate that the E-600 offers the same easy, seamless experience (what you see on its LCD is what you get!). Either way, the focus is quick, precise and easy. If you’re hoping to get more out of your camera than simply capturing and documenting a scene, and enjoy enhancing or customizing an image to make it your own, then you will value the camera’s Art Filters. The filters, which are built into the camera, provide incredible individual artistic control over an image, so that you can spend more time shooting and less time computing. Pin Hole: Adds a nostalgic look and feel to the image with a darkened vignette around the subject connecting the viewer intimately with the subject at the center of the picture. Art Filters are easily activated with the mode dial on the right side of the camera body, and the fun part is that you can see and experiment with the effects on the subject live, on the LCD, before you take the shot! The E-600 travels with you to more places, thanks to its compact size and light body. Capture sharp images on the go with the camera’s in-body Image Stabilization (IS), which virtually eliminates blur with any lens attached. Three IS modes handle any situation. The IS-1 mode is for general shooting and adjusts the sensor on both the horizontal and vertical planes to compensate for movement by the photographer so images stay sharp in low light even at slow shutter speeds. To capture the motion of moving subjects, the E-600 offers two specialized modes: IS-2 mode is ideal for capturing a runner or cyclist traveling by in the horizontal mode, preserving the sense of motion while panning; IS-3 mode achieves the same effect when the camera is held vertically. In either mode, the artistic effects of panning enhance the shot and render the subject in sharp detail with blurred background. Moreover, the E-600 is the world’s smallest DSLR with built-in Image Stabilization, so you’ll feel comfortable taking it on the road with you to capture the action. The new camera’s Face Detection technology reduces the chance of blurred subjects in photography by distinguishing between people’s faces and the background. It tracks up to eight faces within the image area, even if people are moving, and automatically focuses and optimizes exposure for sharp, brilliant portrait pictures (ideal for large family or party group photos). The E-600 can capture images at the highest image-quality setting at a rate of four frames per second. Whether you’re capturing a soccer game, children playing or a bird swooping through the yard, the E-600 ensures that you won’t miss a frame. Perfect Shot Preview enables users to easily preview and select from four thumbnail previews of the photographic effects of white balance and exposure compensation adjustments live on the LCD before taking the photograph. It is an ideal way for novice users to learn about the effects of different photography techniques, visually, without having to scroll through menu options. With 13 preset scene-select modes for every imaginable shooting scenario, automatic modes and full manual controls, the E-600 offers a world of possibilities to photographers. Accepting both CompactFlash Type I & II, UDMA, Microdrives and xD-Picture Cards, the camera provides a choice of data storage options for enhanced flexibility, and it is possible to transfer image files from one card to the other right inside the camera. Life moves too fast to spend time worrying about dust ruining the perfect image. Olympus’ proven Dust Reduction System produces spot-free photos with the exclusive Supersonic Wave Filter™. The patented ultrasonic technology vibrates to remove dust and other particles from the front of the image sensor and captures it on a special adhesive membrane every time the camera is turned on. These spot-free photos liberate users from hours spent retouching photographs at the computer or sending their cameras back to the manufacturer to remove dust trapped inside. With Dust Reduction and the new creative features, Olympus continues to liberate users from the computer and editing software, and enables them to have fun capturing it all while on the go. The HLD-5 Power Battery Holder can hold up to two Lithium Ion BLS-1 batteries to extend the performance life of the E-600 and its existing BLS-1 battery. It also enables effortless vertical shooting with its own separate shutter button and control dial. The Olympus E-600 DSLR will be available in early November 2009. It includes the E-600 Body, USB Cable, Video Cable, Li-Ion Battery Pack (BLS-1), Li-Ion Battery Charger (BCS-1), Shoulder Strap, OLYMPUS Master 2 Software CD-ROM, Manuals and Registration card. Olympus is a precision technology leader, designing and delivering award-winning products for consumer and professional markets. Olympus Imaging America Inc. is responsible for sales in the United States, Canada, Mexico, the Caribbean, and Central and South America. For more information, visit: www.getolympus.com. *Specifications and design are subject to change without any notice or obligation on the part of the manufacturer. All trademarks mentioned herein are the property of their respective holder. ©2009 Olympus Imaging America Inc.